Recovery was defined as 6 months without relapse following remission. A, Low-severity major depressive disorder (MDD), defined as an HRSD score of less than 22 at intake. B, High-severity MDD, defined as an HRSD score of 22 or greater at intake. ADM indicates antidepressant medication; CT+ ADM, cognitive therapy combined with ADM; HRSD, Hamilton Rating Scale for Depression; and dashed lines, median time to recovery (50th percentile). Recovery was defined as 6 months without relapse following remission. A, High-severity chronic major depressive disorder (MDD), defined as an HRSD score of greater than 22 at intake and episode duration of 2 years or more. B, High-severity nonchronic MDD, defined as an HRSD score of 22 or greater at intake and episode duration of less than 2 years. ADM indicates antidepressant medication; CT+ ADM, cognitive therapy combined with ADM; HRSD, Hamilton Rating Scale for Depression; and dashed lines, median time to recovery (50th percentile). Psychiatry Online. American Psychiatric Association Practice Guidelines. Practice guideline for the treatment of patients with major depressive disorder: 3rd rev. Washington, DC: American Psychiatric Association; 2010. www.psychiatryonline.com/pracGuide/pracGuideTopic_7.aspx. Accessed October 9, 2012. First MB, Spitzer RL, Gibbon M, Williams JBW. Structured Clinical Interview for DSM-IV-TR Axis I Disorders, Research Version, Patient Edition With Psychotic Screen (SCID-I/P W/ PSY SCREEN). New York: Biometrics Research, New York State Psychiatric Institute; 2001. Spitzer RL, Williams JBW, Gibbon M, First MB. Structured Clinical Interview for DSM-III-R Personality Disorders (SCID-II, Version 1.0). Washington, DC: American Psychiatric Press; 1990. American Psychiatric Association. Diagnostic and Statistical Manual of Mental Disorders.ed 4. Washington, DC: American Psychiatric Association; 1994. Fleiss JL, Cohen J. Statistical Methods for Rates and Proportions. New York, NY: John Wiley & Sons; 1973. Beck AT, Rush AJ, Shaw BF, Emery G. Cognitive Therapy of Depression. New York, NY: Guilford Press; 1979. Beck AT, Freeman A, Davis DD. Cognitive Therapy of Personality Disorders. 2nd ed. New York, NY: Guilford Press; 2003. This study by Hollon et al., was not double blind, i.e., neither the subjects nor treaters were blind to the treatment(s) given. Unfortunately, no psychotherapy study, and in particular no CBT study where treaters and patients have to undergo cognitive and behavioral exercises, can be double-, or single-, blinded. Raters were “masked”, but this does not make the study single blind because single blind is defined as when the subjects are blind (1). Masked raters only record the report that comes out of the subject-treater system, biased or not. Calling raters “blind” instead of “masked” could be true, however, this nomenclature still does not make the study single-blinded, misleading readers into thinking the study was blinded and/or well-controlled. Blinding is a crucial point in understanding the design of a trial of depression with subjective endpoints. Full allocation blinding of a treatment in a clinical trial is critical for a study of Major Depression where endpoints are subjective (2). The elements of expectation and hope in an unblinded study with subjective endpoints can easily bias subjects’ statements of depressive symptom changes to the raters, and a large N as in this study can easily validate a biased outcome to “statistical significance.” Some researchers may voice the objection that medications may also be unmasked because of certain side-effects noticed by the subjects. This can be true with some medications, but not every trial would be unmasked to subjects as is necessarily the case for CBT, and trials showing significant unmasking should be invalidated whether drug or psychotherapy. Blinding may not be required when studying certain conditions that have strongly objective endpoints, i.e., stroke incidence, bone fracture incidence, death rate, etc. where the intervention’s efficacy would be great compared with random error and bias (3); unfortunately random error and bias is very large in the subjective endpoints studied in depression. The results obtained by Hollon et al. 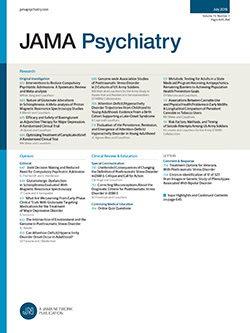 could also be interpreted as that subjects with milder depression included more patients who did not have a medically-responsive depression (4), while for those with greater severity, there was both drug efficacy as well as hope and expectation in the cognitive therapy group biasing the results to the combination therapy. This interpretation is just as plausible as the conclusion that combination therapy is more effective for severe depression. The study design of this clinical trial without double blinding in subjective endpoints is too limited to make any conclusions of superior efficacy for combination therapy. As a final note, it is not a valid study design to mix and compare study arms that have different levels of bias control (i.e., double-blinded drug therapy with unblinded psychotherapy) without being clear this is a severe limitation. This type of research could be called “observation of community treatment”, but it should not be termed a “clinical trial” because that would put unblinded studies with subjective endpoints at the same level of validity as clinical trials with strong double-blinding (5). (1) Friedman LM, Furgerg CD, DeMets DL. Fundamentals of Clinical Trials, Third Edition. Springer; 1998 (or internet search for:“definition of single-blind”). (2) Schulz, KF, Grimes DA, Blinding in Randomised Trials: hiding who got what. The Lancet, 2002:359; 696-700. Feburary 23, 2002. (3) Piantadosi S. Clinical Trials: A Methodologic Perspective, 2nd ed. New York: Wiley-Interscience; 2005. Importance Antidepressant medication (ADM) is efficacious in the treatment of depression, but not all patients achieve remission and fewer still achieve recovery with ADM alone. Objective To determine the effects of combining cognitive therapy (CT) with ADM vs ADM alone on remission and recovery in major depressive disorder (MDD). Design, Setting, and Participants A total of 452 adult outpatients with chronic or recurrent MDD participated in a trial conducted in research clinics at 3 university medical centers in the United States. The patients were randomly assigned to ADM treatment alone or CT combined with ADM treatment. Treatment was continued for up to 42 months until recovery was achieved. Survival analyses based on subdistribution hazard models were used to model treatment outcomes. Interventions Antidepressant medication with or without CT.
Main Outcomes and Measures Blind evaluations of recovery with a modified version of the 17-item Hamilton Rating Scale for Depression and the Longitudinal Interval Follow-up Evaluation. Results Of the 452 participants, 227 were randomized to the CT combined with ADM treatment group, and 225 to the ADM treatment alone group. Combined treatment enhanced the rate of recovery vs treatment with ADM alone (75.2% vs 65.6%; t451 = 2.44; P = .02; hazard ratio [HR], 1.32; 95% CI, 1.06-1.65; number needed to treat [NNT], 11; 95% CI, 6-91). This effect was conditioned on a statistically nonsignificant interaction with severity (t451 = 1.67; P = .09; NNT, 6) and a significant interaction with chronicity (χ2 = 7.66; P = .02; NNT, 6) such that the advantage for combined treatment was limited to patients with severe, nonchronic MDD (84.7% vs 57.7%; n = 147; t146 = 3.88; P = .001; HR, 2.21; 95% CI, 1.48-3.31; NNT, 4; 95% CI, 2-8). There was no difference in the number of patients who dropped out of combined treatment vs ADM treatment alone (18.1% vs 24.8%; t451 = −1.77; P = .08; HR, 0.70; 95% CI, 0.47-1.04). Remission rates did not differ significantly either as a main effect of treatment or as an interaction with severity or chronicity. Patients with comorbid Axis II disorders took longer to recover than did patients without comorbid Axis II disorders regardless of the condition (P = .001). There were no statistically significant differences in the numbers of serious adverse events in the 2 groups (41 in the ADM plus CT group vs 52 in the ADM-alone group; χ1 = 1.76; P = .18). Conclusions and Relevance Cognitive therapy combined with ADM treatment enhances the rates of recovery from MDD relative to ADMs alone, with the effect limited to patients with severe, nonchronic depression. There is a growing consensus1 that simply reducing depressive symptoms (response) is not sufficient and that full normalization (remission) should be the goal of acute treatment. Practitioners are encouraged to switch or augment treatments until remission is achieved or all reasonable alternatives have been exhausted. Sustained remission (recovery) is better still, and it is recommended2 that patients in remission continue to receive treatment until they pass the period of risk for relapse. Most randomized clinical trials do not reflect the aims of personalized medicine. Randomized clinical trials usually test a single ADM delivered for a brief duration, whereas patients in clinical practice can receive treatment for as long as necessary with whatever medications are required to yield the desired result.12 Similarly, CT is delivered in a brief time-limited format in most randomized clinical trials, even though patients with comorbid Axis II disorders need longer treatment.13 Studies in which practitioners are not permitted to adapt treatment to meet the needs of the patient likely underestimate what could be achieved using the best clinical practice.14 We sought to determine whether combining CT with ADM enhances recovery when treatment is personalized. This trial has 2 sequential phases separated by a second randomization. Herein we report on the primary outcome measures for remission and recovery, along with serious adverse events, through the end of the acute and continuation treatment. At the point that any given patient met criteria for recovery, we again obtained consent and randomized these patients to either 3 years of maintenance medication or medication withdrawal (with cognitive therapy discontinued) to assess for recurrence. The primary outcome measure for recurrence will be reported separately. The sample comprised 452 adult outpatients. Inclusion criteria were (1) DSM-IV major depressive disorder (MDD)17 either chronic (episode duration ≥2 years) or recurrent (with an episode in the past 3 years if only the second episode), (2) 17-item Hamilton Rating Scale for Depression (HRSD) score of 14 or more, (3) age 18 years or older, (4) English speaking, and (5) willing and able to provide informed consent. Exclusion criteria were (1) history of bipolar disorder or nonaffective psychosis, (2) substance dependence in the past 3 months, (3) DSM-IV Axis I disorders requiring nonprotocol treatment, (4) DSM-IV Axis II disorders poorly suited to study treatments (antisocial, borderline, and schizotypal), (5) suicide risk requiring immediate hospitalization, (6) medical condition precluding the use of study medications (including pregnancy), (7) current medications that induce depression, or (8) mandated treatment or compensation issues. Acute treatment lasted until the patient met the criteria for remission, defined as 4 consecutive weeks of minimal symptoms; continuation treatment lasted to the point of recovery, defined as another 26 consecutive weeks without relapse. Patients did not need to maintain the symptom levels required for remission to meet the criteria for recovery. Participants who experienced relapse during continuation were required to meet remission criteria again before they were eligible to meet the criteria for recovery. Patients who did not meet the symptomatic criteria for remission within 18 months of treatment were removed from the study and referred for other treatment, as were patients who did not meet criteria for recovery within 36 months. Patients who met only the symptomatic criterion for remission at month 18 (or recovery at month 36) continued treatment until it was determined whether they also met the temporal criteria. Thus, up to 19 months were allowed for remission and up to 42 months for recovery. Full remission was defined as HRSD scores of 8 or less and LIFE ratings of 2 or less for 4 consecutive weeks. After month 12, these criteria were relaxed such that 4 weeks of HRSD scores of 12 or lower or LIFE ratings of 3 or lower were sufficient to meet the criteria for partial remission. Relapse was defined as 2 consecutive weeks of HRSD scores of 16 or more or LIFE scores of 5 or more. Serious adverse events (SAEs) were reported to the respective institutional review boards and to the data safety monitoring board as they occurred. Serious adverse events were defined as any untoward event that compromised the patient’s health including death for any reason, suicide attempt, psychiatric or medical hospitalization, and pregnancy or motor vehicle crash while receiving study medications. Quiz Ref IDA principle-based algorithm was implemented that could involve up to 4 different classes of ADMs and any of the augmenting or adjunctive agents commonly used in clinical practice. Dosages were raised as rapidly as possible and kept at maximum tolerated levels for at least 4 weeks. Treatment in patients who exhibited only a partial response was augmented with additional medications, and treatment in those who showed minimal response (or little additional response following augmentation) was switched to another ADM. Most patients were given multiple trials with easier-to-manage selective serotonin reuptake inhibitors or serotonin-norepinephrine reuptake inhibitors before treatment was switched to more difficult-to-manage tricyclic antidepressants or monoamine oxidase inhibitors. Patients who experienced remission usually received the same medications during treatment continuation, but the prescribing practitioners were free to adjust the doses and augment or switch medications as needed to forestall relapse. The goal was to provide personalized antidepressant therapy using the best clinical practice. These principles were followed in both treatment conditions. A detailed account of the medications used is beyond the scope of this article and will be subsequently reported. The protocol called for patients to meet with their prescribing practitioner weekly for the first month, biweekly thereafter during acute treatment, and monthly during continuation. The initial session lasted 30 to 45 minutes, with subsequent sessions approximately 20 minutes. Ten board-certified psychiatrists and 7 psychiatric nurse practitioners with prescribing privileges provided pharmacotherapy (including J.D.A. and J.Z.). Sessions followed the protocol developed by Fawcett and colleagues23 for the Treatment of Depression Collaborative Research Program. Dr Fawcett oversaw the training and provided consultation throughout the study. Three of us served as the medical directors and provided supervision at the respective sites (J.D.A., R.C.S., and J.Z.). Pharmacotherapy sessions focused on (1) medication management including education about medications, dosage schedules, and adverse effects; and (2) clinical management, including a review of the patient’s functioning in major life spheres and brief supportive counseling. Twelve doctoral-level psychologists, 1 psychiatrist, and 1 nurse practitioner provided CT (including P.R.Y.). The therapists met weekly for 90 minutes at each site to review cases, with on-site supervision provided by 3 of the authors (R.J.D., P.R.Y., and S.D.H.). The therapists followed the procedures outlined in the original treatment manual for CT of depression,24 augmented when indicated for patients with comorbid Axis II disorders.25 The protocol called for 50-minute sessions to be held twice weekly for at least the first 2 weeks, at least weekly thereafter during acute treatment, and then at least monthly during continuation. Therapists were free to vary the session frequency to meet the needs of the patient. Survival analyses were used to model treatment outcomes. In conventional survival analyses, censoring because of attrition is assumed to be unrelated to treatment or patient characteristics and therefore independent of time to the event.26 However, when attrition precludes the occurrence of the event, as it did in this trial, it is a competing risk that can bias estimates of the time to remission or recovery.27 We therefore adopted the subdistribution hazard model developed by Fine and Gray28 to account for the possible nonindependence of the censoring mechanism. The weighted partial likelihood estimation directly assesses the intervention and moderation effects for the target event even in the presence of a competing and possibly informative relationship between multiple competing events. The basic model included main effects for site, treatment, and their interaction. Main effects and treatment interactions for each of the stratification variables were estimated in the full models and retained in the final models only if significant. The resulting probabilities will not correspond exactly to the ratio between the actual number of patients recovered divided by the actual number of patients randomized but will provide a more valid estimate of the actual rates of attrition, remission, and recovery than the raw probabilities. All models were implemented in SAS, version 9.3 (SAS Institute Inc) using the algorithm developed by Zhang and Zhang29 for the subdistribution hazard model. Significance was determined using 2-tailed, unpaired t tests. To characterize the clinical significance of the findings, we computed the number needed to treat (NNT) ratio, a metric used in evidence-based medicine to estimate the number of persons who would need to receive the intervention to produce 1 additional positive outcome.30 Mantel-Haenszel χ2 analysis was used to test for treatment differences in the frequency of relapses and SAEs. A total of 452 patients were randomized: 151 at the University of Pennsylvania, 151 at Rush University, and 150 at Vanderbilt University. A total of 227 were randomized to the ADM plus CT group and 225 to the ADM-alone group. Baseline HRSD score means did not differ significantly as a function of treatment condition or site (overall mean [SD], 22.1 [4.2]; range, 14-33). The Table gives descriptive statistics for the baseline variables. No significant differences between the conditions were observed in these variables, but there were some significant between-site differences. Quiz Ref IDOf the randomized patients, 97 (21.5%) did not complete treatment: 91 dropped out and 6 were withdrawn by the staff (excessive substance use, 4; manic episode, 2). Attrition was more than twice as likely to occur during acute treatment (n = 68) than during continuation (n = 29). Attrition rates were not significantly different in the ADM plus CT group vs the ADM-alone group (18.1% vs 24.8%; t451 = −1.77; P = .08; hazard ratio [HR], 0.70; 95% CI, 0.47-1.04). Patients with Axis II disorders were more likely to drop out irrespective of their condition (26.5% vs 16.6%; t451 = 2.36; P = .02). Patients who did not achieve remission by month 18 (n = 29) or recovery by month 36 (n = 8) were terminated from the study. Termination rates did not differ significantly by condition (ADM plus CT, 7.0%; ADM alone, 9.3%; χ1 = 0.78; P = .38). Remission rates were high and did not differ significantly as a function of treatment (full remission of 63.7% for ADM plus CT vs 59.7% for ADM alone by month 12; t451 = 1.02; P = .31; and full or partial remission of 80.7% for ADM plus CT vs 76.1% for ADM alone by month 18; t451= 1.31; P = .19). Median time to remission was shorter with ADM plus CT than with ADM alone (week 31 vs week 39), but this difference also was not significant. Patients in the ADM plus CT group evidenced fewer relapses than did patients in the ADM-alone group (66 relapses in 44 patients vs 80 relapses in 49 patients, respectively), but this difference was not significant. Recovery rates were higher with ADM plus CT than with ADM alone (75.2% vs 65.6%; t451 = 2.44; P = .02; HR, 1.32; 95% CI, 1.06-1.65; NNT, 11; 95% CI, 6-91) and lower for patients with vs those without comorbid Axis II disorders irrespective of treatment condition (63.8% vs 77.0%; t451 = 3.26; P = .001; HR, 1.46; 95% CI, 1.16-1.84). The main effect of treatment on recovery was conditioned on a nonsignificant interaction with severity (t451 = 1.67; P = .09; NNT, 6) and a significant interaction with chronicity (χ2 = 7.66; P = .02; NNT, 6). There were no other main effects or treatment interactions with the other stratification variables or with site (all P > .10). Figure 2 displays the severity by treatment interaction. Recovery rates for patients with low-severity MDD (intake HRSD median, <22) were similar in the 2 conditions (74.2% vs 70.1% [n = 220]; t219 = 0.77; P = .44; HR, 1.13; 95% CI, 0.83-1.55; NNT, 28; 95% CI, 6-211). For patients with high-severity MDD, the rate was higher with ADM plus CT compared with ADM alone (76.9% vs 60.3% [n = 232]; t231 = 3.00; P = .003; HR, 1.61; 95% CI, 1.18-2.20; NNT, 6; 95% CI, 4-19). Patients with nonchronic MDD also evidenced a higher recovery rate with ADM plus CT compared with ADM alone (79.5% vs 62.8%; n = 280; t279 = 3.37; P = .001; HR, 1.64; 95% CI, 1.23-2.20; NNT, 6; 95% CI, 4-16). No significant difference was observed in patients with chronic MDD (65.8% with CT plus ADM vs 72.1% with ADM alone; n = 172; t171 = −0.98; P = .33; HR, 0.83; 95% CI, 0.58-1.20; NNT, −17; 95%, CI, –72 to –5). We followed up this pattern of findings to see whether severity moderated the effects of chronicity on treatment. The test of the 3-way interaction (severity by chronicity by treatment) did not indicate a significant difference, but it was grossly underpowered.31 We therefore conducted an exploratory analysis to determine whether severity and chronicity contributed independently to the increments observed or whether the effects of each depended on the other. We divided the sample into 4 subgroups defined by severity and chronicity: low severity/nonchronic (n = 133), low severity/chronic (n = 87), high severity/nonchronic (n = 147) and high severity/chronic (n = 85); and then we obtained a significant 4 (subgroup) × 2 (treatment) interaction (χ3, 9.69; P = .02). In both low-severity subgroups, as well as in the high-severity chronic subgroup, small, nonsignificant treatment effects were obtained (P = .54, P = .35, and P = .71, respectively). In the nonchronic severe subgroup, the difference in recovery rate between ADM plus CT (n = 72) and ADM alone (n = 75) was significant (84.7% vs 57.9%; n = 147; t146 = 3.88; P = .001; HR, 2.21; 95% CI, 1.48-3.31; NNT, 4; 95% CI, 2-8) and remained so after Bonferroni correction. Figure 3 depicts treatment effects on recovery, conditioned on chronicity, among patients with more severe depression. Patients did not experience a difference in SAEs with ADM plus CT compared with ADM alone (41 vs 52, respectively; χ1 = 1.76; P = .18). The largest categories were psychiatric hospitalization (17 vs 22) and medical hospitalization (19 vs 24). Two patients made suicide attempts: 1 (twice) in the ADM plus CT group and 1 in the ADM-alone group. There were no completed suicides. There also was no difference in the rate at which those SAEs occurred when time to recovery was taken into account. Combining CT with ADM enhanced the rate of recovery compared with ADM alone in a sample of patients with chronic or recurrent nonpsychotic MDD and minimal exclusions for other psychiatric and medical comorbidities. The modest (10%) increment observed is low in the range of comparable trials7-10 but similar to the one other study11 that also followed a more flexible medication algorithm. Doing so may leave little room for CT to enhance recovery. Quiz Ref IDThe magnitude of this increment nearly doubled for patients with more severe depression or nonchronic MDD episodes, but there was little evidence of benefit for patients with less severe or chronic MDD. These findings are consistent with those from earlier trials. Thase and colleagues32 found that patients with severe recurrent depression were particularly likely to benefit from combined treatment relative to psychotherapy alone, and Kocsis and colleagues11 found no advantage for combined treatment relative to algorithm-guided treatment among patients with chronic depression. In the present study, exploratory analyses suggested that this increment was larger still (nearly tripled) in the one-third (32.5%) of the patients with MDD that was both more severe and nonchronic. Patients with chronic depression (38.1%) and those with nonchronic and less severe depression (29.4%) showed evidence of little increment from combining CT with ADM. It may be that only patients with more severe MDD need CT to be added to ADM and that those with chronic MDD are unable to benefit from its addition. Quiz Ref IDThe study has strengths and limitations. Treating MDD to a fixed outcome rather than for a fixed duration and following a principle-driven algorithm rather than limiting the medications used is more representative of clinical practice than is the typical approach used in randomized clinical trials. Limitations include (1) the reliance on exploratory analyses to examine the joint effects of severity and chronicity given the lack of a significant interaction between recovery rate and severity; (2) the exclusion of patients with nonchronic first-episode MDD, which precluded the opportunity to test for interactions involving chronicity and recurrence; (3) the absence of another psychotherapy or psychotherapy control, in combination with medications, to test for the specificity of CT in accounting for the combined treatment advantage; (4) the absence of a psychotherapy-only condition, which limits the generalizability of the findings to patients receiving CT with concurrent ADM; (5) the lack of blinding for patients and treatment providers to the condition, which may have contributed to the superiority of combined treatment; and (6) the lack of a formal cost-benefit analysis. Cognitive therapy combined with medication treatment enhanced rates of recovery relative to medications alone; this effect may be limited to patients with severe nonchronic depression. Submitted for Publication: January 13, 2014; final revision received May 4, 2014; accepted May 11, 2014. Corresponding Author: Steven D. Hollon, PhD, Department of Psychology, Vanderbilt University, Nashville, TN 37203 (steven.d.hollon@vanderbilt.edu). Retraction and Replacement: This article was retracted and replaced on April 20, 2016, to fix errors in the text, Table, and Figures 1, 2, and 3 (see the Supplement for the retracted article with errors highlighted and replacement article with corrections highlighted). Author Contributions: Drs Hollon and DeRubeis had full access to all of the data in the study and take responsibility for the integrity of the data and the accuracy of the data analysis. Study concept and design: Hollon, DeRubeis, Fawcett, Amsterdam, Shelton, Zajecka. Acquisition, analysis, or interpretation of data: Hollon, DeRubeis, Fawcett, Amsterdam, Shelton, Young, Gallop. Drafting of the manuscript: Hollon, DeRubeis, Amsterdam, Zajecka, Gallop. Critical revision of the manuscript for important intellectual content: Hollon, DeRubeis, Fawcett, Amsterdam, Shelton, Zajecka, Young. Statistical analysis: Hollon, DeRubeis, Zajecka, Gallop. Obtained funding: Hollon, DeRubeis, Fawcett, Amsterdam, Shelton, Zajecka. Administrative, technical, or material support: Hollon, DeRubeis, Fawcett, Amsterdam, Shelton, Zajecka, Young. Study supervision: Hollon, DeRubeis, Fawcett, Amsterdam, Zajecka, Young. Conflict of Interest Disclosures: Dr Shelton reports being a consultant to Bristol-Myers Squibb, Cerecor, Inc, Cyberonics, Inc, Forest Pharmaceuticals, Janssen Pharmaceutica, Medtronic, Inc, Naurex, Inc, Pamlab, Pfizer Inc, Ridge Diagnostics, Shire Plc, and Takeda Pharmaceuticals and receiving grant or research support from Assurex Health, Bristol-Myers Squibb, Elan Corp, Forest Pharmaceuticals, Janssen Pharmaceutica, Jazz Pharmaceuticals, Naurex, Inc, Novartis Pharmaceuticals, Otsuka Pharmaceuticals, Pamlab, and Takeda Pharmaceuticals. Dr Zajecka reports receiving grant or research support from Alkermes, Allergan, AstraZeneca, Cyberonics, Euthymics, ElMindA, Forest Pharmaceuticals, the Cheryl T. Herman Foundation, Hoffman-LaRoche, Naurex, Inc, Otsuka, the National Institutes of Health, Shire Plc, and Takeda Pharmaceuticals; serving as a consultant or on the advisory board of Abbvie, Avanir (Depression Data Safety Monitoring Board), Eli Lilly & Company, Forest Pharmaceuticals, Lundbeck, Pamlab, Shire Plc, and Takeda Pharmaceuticals; and receiving other financial support from the Cheryl T. Herman Foundation. No other disclosures were reported. Funding/Support: This study was supported by grants MH60713 and MH01697 (K02) (Dr Hollon), MH60998 (Dr DeRubeis), and MH060768 (Drs Fawcett and Zajecka) from the National Institute of Mental Health. Wyeth Pharmaceuticals provided venlafaxine, and Pfizer Inc provided sertraline for the trial. Additional Information: Robert J. DeRubeis, PhD (University of Pennsylvania), Jan Fawcett, MD (University of New Mexico), and Steven D. Hollon, PhD (Vanderbilt University), were the principal investigators, and Jay D. Amsterdam, MD (University of Pennsylvania), John Zajecka, MD (Rush University), and Richard C. Shelton, MD (Vanderbilt University), were the coprincipal investigators. Drs DeRubeis and Hollon oversaw the implementation of CT at University of Pennsylvania and Vanderbilt University, respectively, and Dr Young did the same at Rush University. Dr Fawcett oversaw the implementation of pharmacotherapy across the study, and Drs Amsterdam, Zajecka, and Shelton supervised the implementation of pharmacotherapy at the respective sites. Additional Contributions: Brent Freeman, BA, and Bernadette Kooi, MS (University of Pennsylvania), Debra Klbecka, RN, and Matthew Marasco, BA (Rush University), and Margaret L. Lovett, MEd (Vanderbilt University), served as the study coordinators. Giampaolo Gallo, MD, Moira Molloy, MSN, Bobbie Posmontier, PhD, Nancy Rutherford, MSN, Irene Soeller, CRNP, Jeffrey Staab, MD, and Jay D. Amsterdam, MD (University of Pennsylvania), Jagannath Devulapally, MD, Corey Goldstein, MD, Ian Mackey, MD, William Miles, MD, Raj Tummale, MD, and John Zajecka, MD (Rush University), and Virginia Gardner, MSN, Jennifer Scroggie, MSN, Sandra Seidel, MSN, and Vatsal Thakkar, MD (Vanderbilt University), served as study pharmacotherapists. Julie Jacobs, PhD, Cory P. Newman, PhD, and Rita Ryan, PhD (University of Pennsylvania), David C. Clark, PhD, Kristen Flynn, PhD, John Larson, MD, Patricia Meaden, PhD, Chad Owen, PsyD, and Paula R. Young, PhD (Rush University), and Laurel L. Brown, PhD, Kirsten Haman, PhD, Karl N. Jannasch, PhD, Sandra Seidel, MSN, and Dorothy D. Tucker, PhD (Vanderbilt University), served as the cognitive therapists. Kirsten L. Haman, PhD, oversaw the training of the clinical interviewers. All of the above were reimbursed for their participation. William T. McKinney, MD (Northwestern University [emeritus]), Irene Elkin, PhD (University of Chicago [emerita]), Robert Gibbons, PhD, and Mark Siegler, MD (University of Chicago), and Burt Jensen (Federal Bureau of Investigation [retired]) served on the independent data safety monitoring board. Members of the board received an honorarium for their participation. DatStat developed the data entry and patient management system used to conduct the study.